Explore Lisbon's surroundings by going to Sintra (Park and National Palace of Pena & Quinta da Regaleira). The adventure continues: meet the residents at Lisbon Oceanarium, tour the water at your own pace with Nosso Tejo, take a stroll through Alfama, and contemplate the long history of Castelo de S. Jorge. To see other places to visit, traveler tips, maps, and tourist information, read our Lisbon online road trip planner . Ottawa, Canada to Lisbon is an approximately 12-hour combination of train and flight. You can also fly. The time zone changes from Eastern Standard Time to Western European Time, which is usually a 5 hour difference. Plan for somewhat warmer temperatures traveling from Ottawa in September, with highs in Lisbon at 32°C and lows at 19°C. Finish your sightseeing early on the 30th (Sun) so you can travel to Rogil. Start off your visit on the 1st (Mon): enjoy the sand and surf at Praia da Carriagem and then kick back and relax at Praia Vale Dos Homens. To find photos, maps, reviews, and more tourist information, use the Rogil vacation planner . You can drive from Lisbon to Rogil in 3 hours. In September, daily temperatures in Rogil can reach 30°C, while at night they dip to 21°C. Finish your sightseeing early on the 1st (Mon) so you can travel to Albufeira. 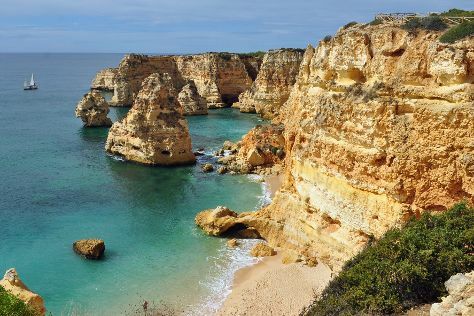 Get out of town with these interesting Albufeira side-trips: Praia da Senhora da Rocha (in Porches), Praia Da Rocha (in Praia da Rocha) and Praia marinha (in Carvoeiro). Pack the 2nd (Tue) with family-friendly diversions at Zoomarine Algarve. The adventure continues: stroll through Nossa Senhora da Rocha Beach and kick back and relax at Praia do Peneco. To see traveler tips, more things to do, ratings, and other tourist information, refer to the Albufeira trip planning tool . Traveling by car from Rogil to Albufeira takes 1.5 hours. October in Albufeira sees daily highs of 28°C and lows of 19°C at night. Wrap up your sightseeing on the 4th (Thu) to allow time to travel to Birmingham. Start off your visit on the 5th (Fri): steep yourself in history at Birmingham Back to Backs. For traveler tips, maps, other places to visit, and tourist information, refer to the Birmingham journey planning website . Traveling by combination of bus and flight from Albufeira to Birmingham takes 6.5 hours. Alternatively, you can do a combination of bus, flight, and train; or do a combination of bus, flight, and train. In October, Birmingham is slightly colder than Albufeira - with highs of 17°C and lows of 9°C. You'll have a few hours on the 5th (Fri) to wrap things up before traveling home.